Do you know that the oldest drawing of vessel in Europe was found on Croatian coast, in Hvar? 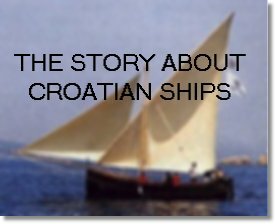 This is a story about Croatian tradition in shipbuilding. Hundred thousands vessels of all types and shapes were built by inhabitants of Croatian coast from times immemorial until nowadays. Here you can find ships that no longer exist as well as ships that still sail. If you like Naval Architecture and ships read our pages. If you want to learn more about Croatia - "Small country for great holidays" - follow our links to some other Croatian pages. You may find something interesting to you. We love rafting. Take a trip with us on the rivers Zrmanja and Cetina. Besides those old ships, big merchant vessels were built in Croatian shipyards in last 50 years. You are wondering how we launch them into the sea? Click here to see the movie and enjoy.